There’s no denying the benefits of a college education: the ability to compete in today’s job market, increased earning power, and expanded horizons. But these advantages come at a price. And yet, year after year, thousands of students graduate from college. So, how do they do it? Many families finance a college education with help from student loans and other types of financial aid such as grants and work-study, private loans, current income, gifts from grandparents, and other creative cost-cutting measures. But savings are the cornerstone of any successful college financing plan. It’s important to start a college fund as soon as possible, because next to buying a home, a college education might be the biggest purchase you ever make. According to the College Board, for the 2016/2017 school year, the average cost of one year at a four-year public college for in-state students is $24,610, while the average cost for one year at a four-year private college is $49,320. 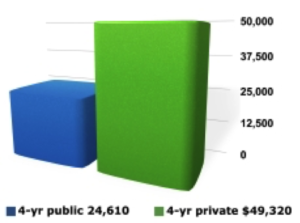 Many private colleges cost substantially more. Even though college costs are high, don’t worry about saving 100% of the total. Many families save only a portion of the projected costs–a good rule of thumb is 50%–and then use this as a “down payment” on the college tab, similar to the down payment on a home. The more you save now, the better off you’ll likely be later. A good plan is to start with whatever amount you can afford, and add to it over the years with raises, bonuses, tax refunds, unexpected windfalls, and the like. If you invest regularly over time, you may be surprised at how much you can accumulate in your child’s college fund. Table assumes an average after-tax return of 6%. This is a hypothetical example and does not reflect the actual performance of any investment. All investing involves risk, including the possible loss of principal, and there can be no guarantee that any investing strategy will be successful. You’re ready to start saving, but where should you put your money? There are several college savings options, and it’s smart to consider tax-advantaged strategies whenever possible. Here are some options. A college savings plan is an individual investment account that lets you direct your contributions to one or more of the plan’s investment portfolios. 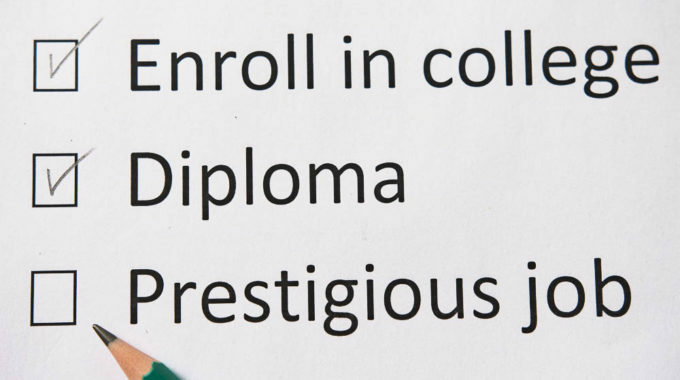 With a prepaid tuition plan, you purchase tuition credits at today’s prices for use at specific colleges in the future. With either type of plan, participation isn’t restricted by income level and lifetime contribution limits are high, typically $300,000 and up (limits vary by state). A Coverdell education savings account (ESA) is a tax-advantaged education savings vehicle that lets you contribute up to $2,000 per year for a beneficiary’s K-12 or college expenses. Your contributions grow tax deferred and earnings are tax free at the federal level if the money is used for qualified education expenses. You have complete control over the investments you hold in the account, but there are income restrictions on who can participate, and the $2,000 annual contribution limit isn’t likely to put much of a dent in college expenses. The interest earned on Series EE and Series I saving bonds is exempt from federal income tax if the bond proceeds are used for qualified college expenses. These bonds earn a guaranteed (as to the timely payment of principal and interest by the federal government), modest rate of return, and they are easily purchased at most financial institutions or online. However, to qualify for tax-free interest, you must meet income limits. A custodial account allows a minor to hold investment assets in his or her own name with an adult as custodian. All contributions to the account are irrevocable gifts to your child, and assets in the account can be used to pay for college. When your child turns 18 or 21 (depending on state law), he or she will gain control of the account. Earnings and capital gains generated by the account are taxed to your child each year. Under the kiddie tax rules, for children under age 19 and for full-time students under age 24 who don’t earn more than one-half of their support, the first $1,050 of earned income is tax free, the next $1,050 is taxed at the child’s rate, and any amount over $2,100 is taxed at your rate. Though technically not a college savings option, some parents use Roth IRAs to save and pay for college. Contributions to a Roth IRA can be withdrawn at any time and are always tax free. For parents age 59½ and older, a withdrawal of earnings is also tax free if the account has been open for at least five years. For parents younger than 59½, a withdrawal of earnings–typically subject to income tax and a 10% premature distribution penalty–is spared the 10% penalty if the withdrawal is used to pay for a child’s college expenses. Many families rely on some form of financial aid to pay for college, which includes loans, grants, scholarships, and work-study. Financial aid can be based on financial need or on merit. To determine financial need, the federal government and colleges look primarily at your family’s income, but other factors come into play, including how many children you’ll have in college at the same time and your assets. To get an idea of how much aid your child might be eligible for at a particular college, you can fill out the net price calculator on that college’s website. The bottom line, though, is don’t rely too heavily on financial aid. Although it can certainly help cover college costs, student loans often make up the largest percentage of the typical aid package, and excessive student loan debt can negatively affect borrowers for years. The lesson? The more you save now, the less you and your child will need to fund later. Note: Investors should consider the investment objectives, risks, charges, and expenses associated with 529 plans before investing; specific plan information is available in each issuer’s official statement. Also, before investing, consider whether your eligibility for any state tax benefits is contingent on your participation in your own state’s 529 plan. There is the risk that the investments may not perform well enough to cover college costs as anticipated. Copyright 2006-2017 Broadridge Investor Communication Solutions, Inc. All rights reserved. *Non-deposit investment products and services are offered through CUSO Financial Services, L.P. (“CFS”), a registered broker-dealer (Member FINRA / SIPC) and SEC Registered Investment Advisor. Products offered through CFS: are not NCUA/NCUSIF or otherwise federally insured, are not guarantees or obligations of the credit union, and may involve investment risk including possible loss of principal. Investment Representatives are registered through CFS. The Credit Union has contracted with CFS to make non-deposit investment products and services available to credit union members. Full Employment: Are We There Yet? Low Volatility: Calm Before the Storm? Full Employment: What Happens Now? Copyright 2018 - All Rights Reserved | CUSO Financial Services, L.P.